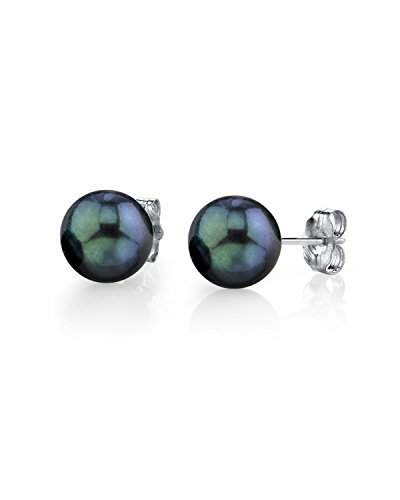 These exquisite pearl stud earrings feature two lustrous AA+ quality dyed black Japanese Akoya pearls hand picked directly from the pearl farms of Japan. The pearls are mounted on the finest 14K gold backings in your choice of white or yellow gold. Our items come packaged in a beautiful jewelry box, perfect for gifting. ✦TOP QUALITY✦ Hand selected AA+ quality round black Akoya cultured pearl stud earrings with genuine 14K gold push backings. Our Akoya pearls are imported directly from the pearl farms of Japan and represent the finest luster & quality. These pearl earrings are accompanied by a Genuine Cultured Pearl Guarantee.